Boring vegetable sides are easy to understand – it’s hard enough to come up with a main dish for dinner at the end of a long day, so by the time you get to the side dishes, opening up a can or drizzling bottled dressing on a bagged salad seems like all you can handle. That’s why a recipe like this one is such a lifesaver. Tangy, sweet and salty, with a deep roasted flavor and a hint of garlic, these balsamic roasted carrots require only five minutes of prep time followed by about 30 minutes in the oven. They’re so simple and versatile, you’ll find yourself making them again and again. Bagged “baby carrots” are a healthy, inexpensive convenience food. They’re usually cut from larger carrots that have been selected for sweetness and bright orange color. Despite Internet rumors to the contrary, they are not “permeated” with chlorine. Almost all carrots, even the ones labeled organic, are washed with a chlorine solution that is then rinsed away. This reduces microbes and lets the carrots stay fresh longer. 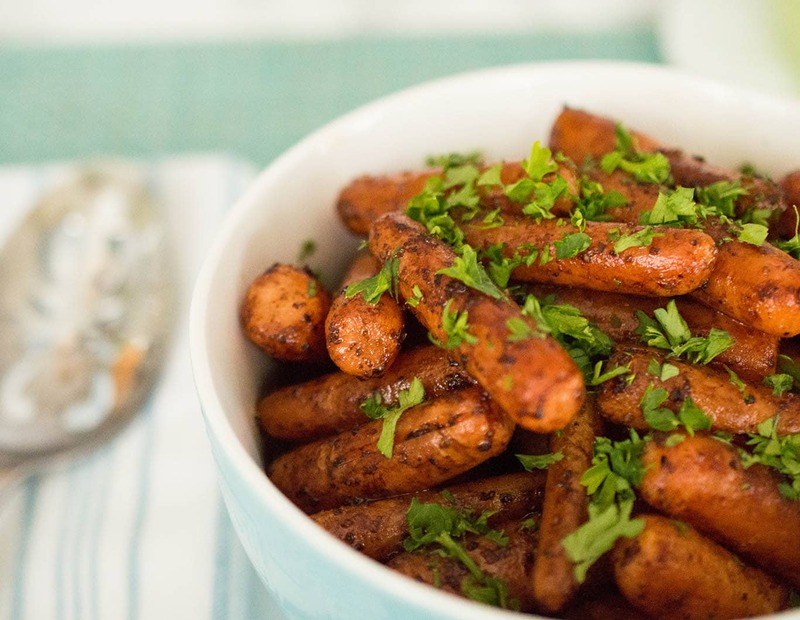 To begin this recipe, drizzle olive oil over baby carrots, sprinkle on some garlic salt and black pepper, toss with your hands until the carrots are well coated, and roast in the oven for 20-30 minutes. Roasting vegetables brings out their natural sweetness, and the garlic salt and black pepper provide a nice contrast. While the carrots are roasting, prepare the balsamic mixture by combining half balsamic glaze and half balsamic vinegar in a small bowl. Balsamic vinegar can sometimes have an overwhelmingly tart flavor, especially if you are using a cheaper supermarket brand like I did for this recipe. You could solve this problem by buying an expensive premium balsamic, which is sweeter and mellower, but a less expensive way to get a sweet-tart balsamic flavor is to mix balsamic vinegar and balsamic glaze. You can use a ready-made balsamic glaze, or make your own using my Clean Eating Balsamic Glaze recipe. When the carrots are almost done, toss them with the balsamic mixture, then return them to the oven to finish roasting. Finally, sprinkle on some chopped parsley for a gorgeous fresh side you can make any night of the week. 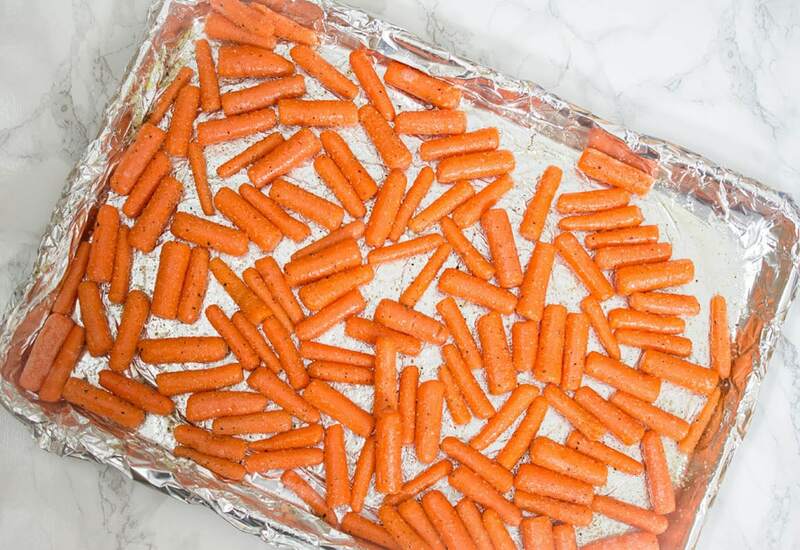 Spread carrots in a single layer on the baking sheet. Drizzle with olive oil, and sprinkle with garlic salt and pepper. Toss carrots with your hands until they are evenly coated with oil, salt and pepper. Roast carrots for 20 minutes if you want crisp-tender carrots, or 30 minutes for softer carrots with a deeper roasted flavor. While carrots are baking, combine the balsamic vinegar and balsamic glaze in a small bowl. Remove carrots from oven. Drizzle balsamic mixture over the carrots, and stir gently with a wooden spoon or silicone spatula until carrots are evenly coated. Return carrots to oven and bake for 3 minutes. Remove carrots from oven and stir a second time to distribute glaze evenly. Bake for 3 more minutes. 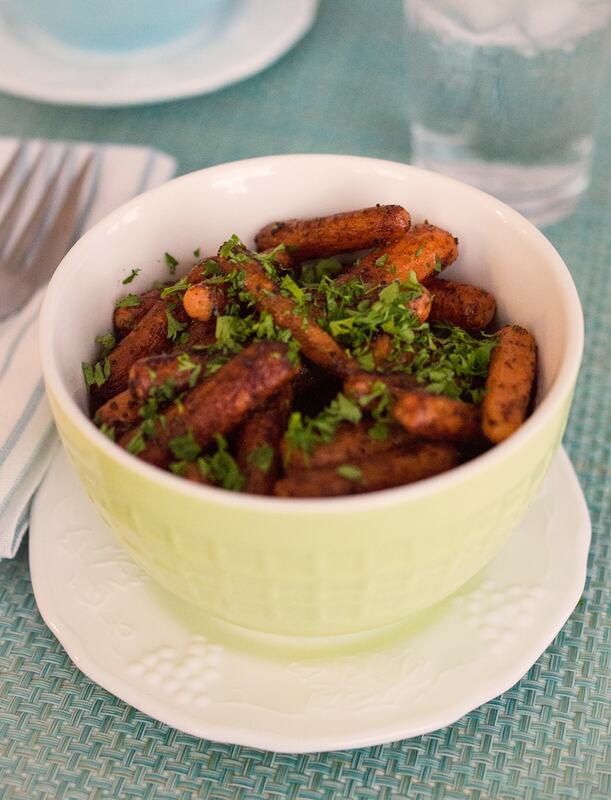 Remove carrots from oven, transfer to serving dish, and sprinkle with parsley.